Of Christ’s descent into hell we have confirmation in the general epistle of the Apostle Peter, where it is said: “For Christ also hath once suffered for sins, the just for the unjust, that He might bring us to God, being put to death in the flesh, but quickened by the Spirit; by which also He went and preached unto the spirits in prison…” (1 Peter 3:18-19). This clearly shows that Christ descended with His Divinity into the prison of the spirits, i.e. souls, and preached repentance to them. The same is said in another place of the same epistle: “For this cause was the Gospel preached also to them that are dead, that they might be judged according to men in the flesh, but live according to God in the spirit” (1 Peter 4:6). Of great importance in explaining this point is the homily of St. John Chrysostome that is read at the Paschal liturgy. Among other things it says that upon meeting Christ hell “was embittered,… was abolished,… was mocked,… was slain,… was overthrown,… was fettered.” It is further said that upon Christ’s death on the cross hell, having accepted a mortal body, found itself facing God; having accepted the dust of earth, met with heaven; having accepted that which was visible, i.e. a human body, human nature, it was vanquished by that which was invisible, i.e. Divinity. Afterwards St. Epiphanius describes Adam’s talk with Christ. Adam heard the footsteps of the approaching Christ just as he had heard them erstwhile in the Garden of Eden after his sin of disobedience. At that time he felt embarrassment and fear, but now he felt joy and elation. Turning to all the other souls, the repentant Adam cried out exultantly: “My Lord is with all.” And Christ replied: “And with thy spirit.” Then, taking him by the hand, Christ resurrected him, telling him of all that had been done for his salvation and for the salvation of all mankind. 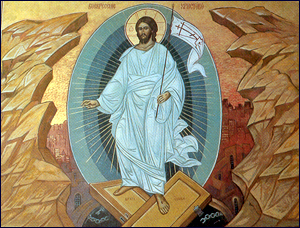 Christ arose from the dead in the early hours of Sunday morning. The exact time of His Resurrection is unknown to us, since no one saw Him at that moment, but the event was confirmed when the Myrrh-bearing Women came to the tomb at dawn, in order to anoint Christ’s body with aromatic oils. Thus Sunday, the first day of the week, is the day of Christ’s Resurrection. If on Saturday He had silently vanquished the kingdom of death, on Sunday everyone knew of it, convinced of the fact that it was He Who vanquished death and the devil. According to St. Gregory Palamas, Sunday is also called the eighth day because on that day took place Christ’s Resurrection, which was the eighth resurrection in the history of mankind. Three resurrections from the dead were wrought in the Old Testament (one by the prophet Elias and two by the prophet Elisha), and four resurrections were wrought by Christ in the New Testament (the daughter of Jairus, the son of the window of Nain, then Lazarus, and finally all those who arose from the dead on Passion Friday). Consequently, the eighth and the greatest resurrection was the Resurrection of Christ. In essence, it is not only the eighth, but also the first in regard to the anticipated resurrection of all the dead at the end of the world. On Sunday, the first day of creation, light was created. In the resurrection of Christ, on the first day of renaissance, appeared the light of the Resurrection, which is also the light of the Transfiguration and the Pentecost. On that day Christ’s human nature threw off the shackles of mortality and corruption. Moreover, Sunday is also called a holy day because it is precisely on such a day of the week that the major events in Christ’s life took place. Also, (according to St. Peter Damascene), Christ’s Second Coming is expected to occur on a Sunday, as well as the universal resurrection of the dead. For this reason Christians assign such great significance and importance to this day, and also strive to sanctify it, because the coming of Christ will be sudden. We are also moved by the thought that every Sunday the Church commemorates Christ’s Resurrection in its wondrous troparia. 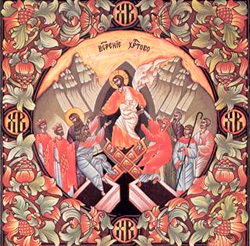 Thus, besides the annual feast of Pascha, there is also the weekly Pascha, the so-called minor Pascha, or the bright day of Sunday.